The main theme of Yoga Vasistha is that we are undergoing a dream from which we must awake. This dream represents our association and identification with the world. Dream means that whatever is ... is false. Nothing in a dream can be true. Waking up from that dream is the ultimate goal of our living... awakening. The First chapter, On Dispassion - The Fall of Rama. Rama said, “... what do people call happiness and can it be had in the ever-changing objects of this world? All beings in this world take birth but to die, and they die to be born! I do not perceive any meaning in all these transient phenomena which are the roots of suffering and sin. Unrelated beings come together; and the mind conjures up a relationship between them. Everything in this world is dependent upon the mind, upon one’s mental attitude. On examination, the mind itself appears to be unreal! But we are bewitched by it. We seem to be running after a mirage in the desert to shake our thirst! Rama continued, “Equally useless, O Sage, is the wealth which deludes the ignorant. Unsteady and fleeting, this wealth gives birth to numerous worries and generates an insatiable craving for more. Wealth is no respecter of persons: both the good and the wicked can become wealthy. However, people are good, compassionate and friendly only till their hearts are hardened by the passionate pursuit of wealth. ... Wealth and happiness do not dwell together. Rare is a wealthy man who does not have rivals and enemies who scandalize him. ... Indeed, wealth seeks him who has already been chosen by death. Even so is the life-span, O Sage. Its duration is like that of a water droplet on a leaf. The life-span is fruitful only to those who have Self-knowledge. Rama continued, “It is when the mind-stuff is enveloped by craving that innumerable errors arise in the darkness of ignorance thus caused. This craving dries up the good and noble qualities of the mind and heart, like sweetness and gentleness of disposition, and makes me hard and cruel. Rama said, “Even childhood, the part of life which people ignorantly regard as enjoyable and happy, is full of sorrow, O Sage. Helplessness, mishaps, carvings, inability to express oneself, utter foolishness, playfulness, instability, weakness – all these characterize childhood. 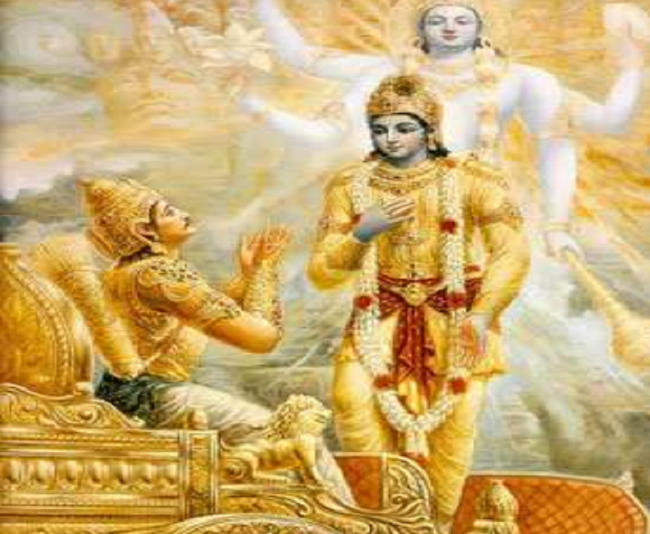 Rama continued, “In his youth, man is a slave of sexual attraction. In the body which is no more than the aggregate of flesh, blood, bone, hair and skin, he perceives beauty and charm. If this ‘beauty’ were permanent, there would be some justification to the imagination; but, alas, it does not last very long. On the contrary, very soon the very flesh that contributed to the attractiveness, the charm and the beauty of the beloved is transformed first into the shriveled ugliness of old age, and later consumed by fire, or by worms, or by vultures. Yet, while it lasts this sexual attraction consumes the heart and the wisdom of the man. ... When the child is dissatisfied with its childhood, youth takes over; when youth is plagued by dissatisfaction and frustration, old age overpowers it – how cruel is life. Even as wind tosses a dew-drop from a leaf, old age destroys the body. Even as a drop of poison when it enters the system soon pervades it, senility soon pervades the entire body and breaks it down, and makes it the laughing stock of other people. Rama continued, “All enjoyments in this world are delusion, like the lunatic’s enjoyment of the taste of fruits reflected in a mirror. All the hopes of man in this world are consistently destroyed by Time. Time alone, O Sage, wears everything out in this world; there is nothing in creation which is beyond its reach. Time alone creates innumerable universes and in a very short time Time destroys everything. Time allows a glimpse of itself through its partial manifestation as the year, the age, the epoch; but its essential nature is hidden. This Time overpowers everything. Time is merciless, inexorable, cruel, greedy, and insatiable. Time is the greatest magician, full of deceptive tricks. Having said so, Rama remained silent.